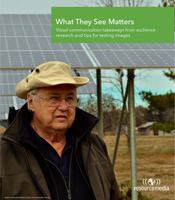 What They See Matters provides visual communication takeaways from audience research and tips for testing images. Have you ever picked out what you thought was the perfect gift for a friend or family member, only to find out when they opened it that it wasn’t quite what they had hoped for? Thank goodness for receipts. Communicators pick out “gifts” of a sort — pictures and words for audiences that we hope will be well-received. Our predictions about what will work might be spot on, or we might unintentionally serve up the communication equivalent of the Father’s Day tie that’s never worn. How can you maximize the hits and minimize the misses? At Resource Media we focus a lot on visual communication and have found that testing images in advance with target audiences maximizes the hits. In other words, don’t presume others will see and react to a picture the same as we do. To assist more groups with testing visuals, we’ve produced a new visual storytelling best practices guide called What They See Matters. And once you’re ready to create your own project, be sure to download and use our visual project planning worksheet.